I was waiting at the house of the family I babysit for the children to come home from school. The brother rushed in first and said surprisingly calmly, “A roller skater knocked [my sister] down.” His mom asked if she was alright. “Is she crying?” He responded that yes, she was crying. The boy went back out to retrieve her. A few moments later, he re-entered with his sister close behind. She was no longer crying, but her nose had a scrape and so did her elbow. Her hair fell tangled from her ponytail over her face. But after a hug from mom, she ran over and sat next to me on the couch. She held her small hand out to me. 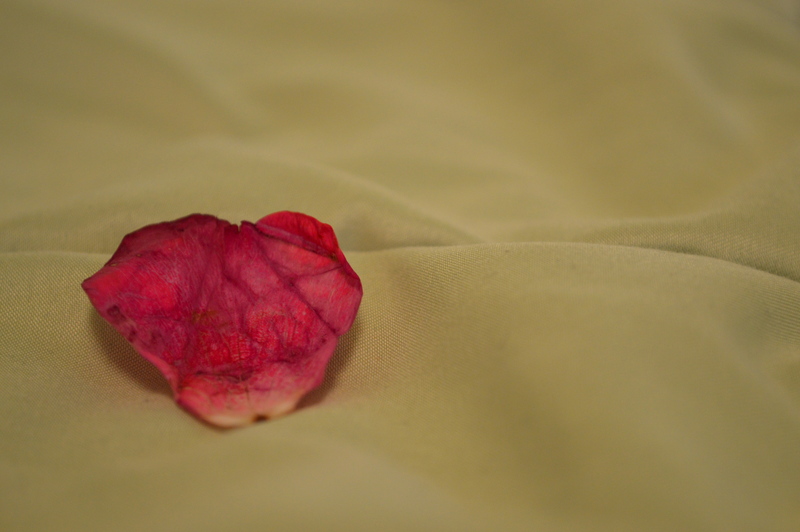 In it was a petal, slightly crinkled, but bright pink and alive. This 5-year-old girl, who I call my girly girl because she loves all things pretty and, well, girly, has brought little gifts like this before, each one sweetly useless. “What does it remind you of, sweetie?” I asked. I felt my throat tie up and a smile involuntarily spread across my face. All the pretty in the world. This was exactly what God has been teaching me – that even when I’m knocked down, have scars from the fall, and my life seems a mess, that even in all that, there is pretty. There are pretty graces to be found. Sweet and beautiful. Loving reminders of His love for me. Sometimes it requires the simple eyes of childlike faith to see them, though. I get so caught up in looking for large, complex gifts that I forget to notice the ones right before me. Like the small petal. Its vibrant colors, a gradient of rosy pink to cream. Its soft, velvet texture and intricate veins. This girl stopped me, slowed me to see with her eyes the pretty that God placed in the moment. “Thank you so much, honey. You just made my day.” She gave me a hug and I kissed her sweet, sweaty forehead. Did she know? Did she understand the significance of her gift? Maybe not the way I did. But this beautiful young girl who I love so dearly saw what I had neglected. These small gifts of every day – they’re to remind me of all the pretty in His world.